When Apple announced new iMacs last month, it included a major step forward amid the subtle-but-welcome refinements in most of the models: the first ever iMac to offer a quad-core processor. The new high-end 27-inch iMacs are the first to use Intel’s Core i5 and Core i7 quad-core processors, and they were not available at the time of the announcement. But finally, the wait is over, and the Core i5 and Core i7 27-inch iMacs have arrived—and let me tell you, it was worth the wait. There are four standard iMac configurations, three of which have 3.06GHz Core 2 Duo processors and were reviewed recently. The fourth standard configuration is a $1999 model that has the same 27-inch screen, 1TB hard drive, and 4GB of RAM as the $1699 27-inch 3.06GHz Core 2 Duo iMac ( ), but features a more powerful ATI Radeon HD 4850 graphics card with 512MB of GDDR3 memory and Intel’s Core i5 quad-core processor running at 2.66GHz. The Core i5 has 8MB of L3 cache shared among the processing cores. As an upgrade option to the Core i5 iMac, you can swap in a 2.8GHz Core i7 quad-core processor for $200 more. The Core i7 also features Turbo Boost (for speeds of up to 3.46GHz), and it also has Hyper-Threading technology that can present itself to highly threaded applications as having eight virtual cores. Longer bars are better. Blue bars in italics represent reference systems. Macworld Lab testing by James Galbraith, Chris Holt, Helen Williamson, and Roman Loyola. To see how well the new quad-core iMacs perform, we ran our overall system performance test suite, Speedmark 6, and the results were quite impressive. In fact, with a Speedmark 6 score of 209, the 2.66GHz Core i5 iMac is the fastest standard configuration Mac we’ve ever tested. It was three percent faster overall than the 2.66GHz Quad-Core Mac Pro ( ), and 1.5 percent faster overall than the 2.26GHz 8-core Mac Pro ( ). Comparing the Core i5 iMac’s Speedmark 6 scores to its iMac siblings, the Core i5 iMac was 27 percent faster overall than the second fastest iMac we’ve tested, the recently released 21.5-inch 3.06GHz Core 2 Duo iMac with 1TB hard drive and ATI graphics ( ). Since the Core i5 iMac has the same hard drive as two of the other three new iMacs, we didn’t see a big difference in our file duplication test, and our unzipping test results were pretty flat across the board. However, we did see a 25 percent improvement in the Core i5 iMac’s Compressor score when compared to the 21.5-inch 3.06GHz iMac, a 26 percent increase in Call of Duty frame rates, a whopping 71 percent improvement in our HandBrake test, an 88 percent faster performance in our Cinebench multiple CPU test, and the new Core i5 iMac posted a MathematicaMark score more than twice as high as the 3.06GHz iMac. That’s a lot of performance bang for an extra $200. Comparing the new Core i5 iMac to the Mac Pro models, we see the speed advantage going the iMac’s way in our Zip, iTunes, iMovie export, Call of Duty frame rates, and Compressor tests. The Mac Pros stood their ground on our HandBrake, iMovie import test, Cinebench CPU test, and MathematicaMark trials. Our tests of the built-to-order Core i7 iMac (which, other than the processor, has identical specifications as the stock Core i5 iMac) showed even greater performance prowess. With a Speedmark 6 score of 225, the $2199 Core i7 iMac was nearly 8 percent faster than the Core i5 iMac. 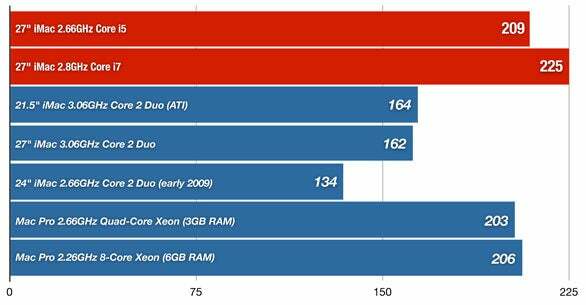 The Core i7 was nearly 11 percent faster than the $2499 2.66GHz Quad-Core Mac Pro and 9 percent faster than the 2.26GHz 8-Core Mac Pro, which sells for $1100 more. In our tests, there were a few tasks where having eight physical processing cores was beneficial, like our MathematicaMark and Cinebench CPU tests. Best results are in bold. References systems are in italics. How we tested. Call of Duty score is in frames per second (higher is better). MathematicaMark is a performance score (higher is better). All other scores are in minutes:seconds (lower is better). Speedmark 6 scores are relative to those of a 2.13GHz Core 2 Duo MacBook, which is assigned a score of 100. All systems were tested with 10.6.1 except for the Core 15 and Core 17 iMacs, which had 10.6.2. All Macs were tested with 4GB of RAM except as noted. We duplicated a 1GB file, created a Zip archive in the Finder from the two 1GB files and then unzipped it. We converted 90 minutes of AAC audio files to MP3 using iTunes’ High Quality setting. In iMovie '09, we imported a camera archive and exported it to iTunes using the Mobile Devices setting. We ran a Timedemo at 1024-by-768 with 4X anti-aliasing on in Call of Duty 4. We imported 150 JPEGs into iPhoto '09. The Photoshop Suite test is a set of 14 scripted tasks using a 50MB file. Photoshop’s memory was set to 70 percent and History was set to Minimum. We used Compressor to encode a .mov file to the application's H.264 for video podcast setting. In HandBrake we ripped a DVD chapter to the hard drive. We recorded how long it took to render a scene with multiprocessors in Cinebench. We ran the Evaluate Notebook test in MathematicaMark 7. We ran the WorldBench 6 multitasking test on a Parallels 5 VM running Windows 7 Professional. We timed the import and thumbnail/preview creation time for 150 photos in Aperture.—Macworld Lab testing by James Galbraith, Chris Holt, Helen Williamson, and Roman Loyola. The new quad-core iMacs are outwardly identical to the 27-inch 3.06GHz Core 2 Duo iMac released last month. The quad-core iMacs feature an LED backlit screen covered with glass at a 16:9 aspect ratio, an integrated iSight camera, four USB 2.0 ports, one FireWire 800 port, a Mini DisplayPort, and a new SD memory card slot. In terms of connectivity all new iMacs offer gigabit Ethernet, 802.11n wireless networking, and Bluetooth 2.1 + Enhanced Data Rate. The 27-inch iMacs ship with a 1TB 7200rpm Serial ATA hard drive, with a 2TB hard drive option available for an extra $250. With the new 2.66GHz Core i5 iMac and the 2.8GHz Core i7 iMac, Apple has not only blurred the line between consumer and professional systems, it's darn near erased it. 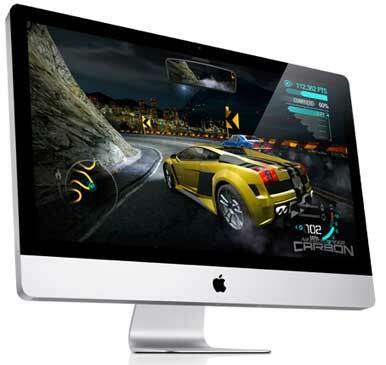 The 2.66GHz Core i5 iMac offers faster performance at most tasks than the 2.66GHz Quad-Core Mac Pro. The Core i5 iMac also has more memory and more storage space than the 2.66GHz Quad-Core Mac Pro, while being $500 less (plus you get a 27-inch screen with the iMac). Unless you absolutely require additional PCI cards, multiple internal hard drives, or a lot of RAM, the Core i5 iMac makes a strong case for the being the go-to system for most Mac professionals.